Albinism occurs when one of several genetic defects make the body unable to produce or distribute melanin, a natural substance that gives color to your hair, skin, and iris of the eye. A child with albinism will have one of the following symptoms: absence of coloring from the hair, skin, or iris of the eye; lighter than normal skin and hair; or patchy, missing skin color. Albinism is caused by a mutation in one of several genes. Each of these genes provides instructions for making one of several proteins involved in the production of melanin. A mutation may result in no melanin at all or a significant decline in the amount of melanin. Albinism is a hereditary condition. It is usually inherited in a recessive pattern, meaning both parents must carry the albinism gene to have a child with albinism. 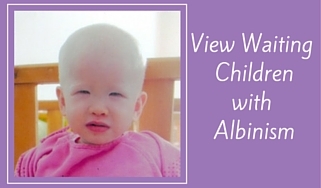 Many forms of albinism are associated with the following symptoms: light sensitivity (photophobia), rapid eye movements (nystagmus), vision problems, and occasionally functional blindness or crossed eyes (strabismus). Albinism cannot be cured with medicine or surgery. Frequent eye exams are necessary as the child may have decreased vision. Providing large, clear pictures/letters to children with albinism can help develop both vision and language skills. Wearing hats and sunglasses, even when indoors, can help make a child more comfortable and less sensitive to light. Wearing sunscreen is important anytime a child goes outside in order to prevent sunburn. Albinism cannot be cured with medicine or surgery. Frequent eye exams are necessary as the child may have decreased vision. Providing large, clear pictures/letters to children with albinism can help develop both vision and language skills. Wearing hats and sunglasses, even when indoors, can help make a child more comfortable and less sensitive to light. Wearing sunscreen is important anytime a child goes outside in order to prevent sunburn. People with albinism can live very full, successful lives.